HeyPlantMan! 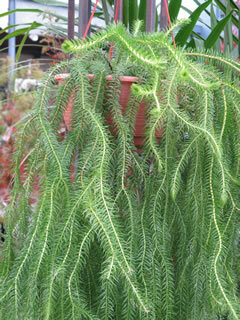 Exotic Tropical Plants from St. Pete FL: Easter Weekend March 26th 2016 Lycopodium fever ! Easter Weekend March 26th 2016 Lycopodium fever ! Greetings all and we are ready for a super Easter Weekend at Market and have some great shows coming up ! At left, is one of our rarest offerings, the "Tassel Fern", aka Lycopodium squarrosum. Very hard to find and not the easiest thing to propagate, it is one of the softest, most unusual plants around. It loves shade/filtered light and good moisture. It looks great in a hanging basket, as it cascades down. This and other great exotic plant product will be available this weekend at Sat. Morning Market and at our upcoming botanical shows. This weekend, we are restocked back up on our popular mini succulents and cacti, and we have yummy herbs and perennials for your Butterfly gardens, and more ! Sat. March 26th, Saturday Morning Market, downtown St. Petersburg, Al Lang Field parking lot. Next weekend, we have 2 big events to cover !